Cloud imaging benefits Make-A-Wish kids, families. Thanks to the use of cloud-based technology at an Orlando, Florida, trauma hospital, children in the Make-A-Wish Foundation program are experiencing less unnecessary radiation and more streamlined care. As part of a pilot program launched late last year at Arnold Palmer Hospital for Children in partnership with Nuance Communications, patients and families have access to Nuance's image-sharing technology as they plan their once-in-a-lifetime trips. According to Shoba Srikantan, MD, a pediatric critical care physician at Arnold Palmer Hospital for Children at Orlando Health, roughly one-half of all Make-A-Wish children travel through Central Florida during the Wish process. Whether a child's dream waits at Disney World, SeaWorld, or on a cruise ship, Srikantan finds herself meeting many of these children when a medical hiccup occurs. "If something unexpected happens when they are traveling, Arnold Palmer Hospital for Children is where they end up, as we're the only level 1 trauma center in the Orlando area," she says, noting that there are myriad reasons a Make-A-Wish child might require emergency medical care during their trip. "Some children are immunocompromised and would need medical attention if they have a fever or respiratory distress," she explains. "Similarly, children with brain tumors or certain cancers could become symptomatic from underlying disease or even the progression of disease." While these children are seen by their physicians before they travel, children and families acknowledge the potential need for medical assistance at any time. However, they rarely travel with medical images. "While incoming Make-A-Wish families usually pack a printout of their medications, they very rarely have the information I need—the child's medical images," Srikantan explains. "Medical imaging plays a key role in how we determine treatment, as imaging studies are vital to truly understanding the patient's condition and whether something is progressing or staying the same. On the rare occasion a family does bring images on the trip, they're often on CDs that are corrupt or on a system that is hard to navigate." As a pediatric radiologist, Michael Gurian, MD, chief of pediatric radiology at Arnold Palmer, says the lack of clinical context for decision making hinders the Arnold Palmer radiology team's ability to treat these special patients. "However, obtaining prior images from the patient's primary care physician is very difficult," he says. "With HIPAA laws, we can't just call a hospital and request patients' imaging studies, and families rarely bring images with them on Wish trips. It's fair to say, 99% of the time we don't have a Wish child's prior studies. So we'd have no choice but to expose the child to additional imaging." Gurian offers one example of how the lack of access to images could affect patient care. "When a Make-A-Wish child travels to our facility, it's typically the first time we've viewed the case," he says. "Without clinical context, such as prior images, it's impossible to know if the child's symptoms have progressed or have been stable for a long time—which is particularly important information for Make-A-Wish children, considering they have complex and often critical medical problems. As a result, the most common problem we face is unnecessary admissions. "For example, a sick Make-A-Wish child comes into our hospital and, without context, we can't determine if the patient's status is a baseline or if the symptoms are even related to the disease," Gurian continues. "For conservative management, we usually admit the patient for further examination and treatment. Yet, the child may not need admission, and we're looking at something that's been stable for years. In this scenario, the child is unnecessarily treated and tested, which runs up costs, exposes the child to additional radiation, creates more anxiety for the family and, ultimately, ruins his or her Wish trip—all because we don't have all the necessary information at our fingertips." Intracranial shunt catheter malfunctions are a particularly difficult issue to treat without prior medical images. "Many children have intracranial shunt catheters in place and find themselves in the emergency department with a clinical concern for shunt malfunction," he says. "For these children, the size of the ventricular system in relation to a previous examination will help to determine whether the shunt is working properly. Without a reference examination, we do not have the clinical context to provide guidance to answer that clinical question." Unnecessary radiation and admissions are two obvious reasons physicians would prefer to have patients' prior medical images when providing care. But Srikantan says a lack of access to a child's medical images can have other, nonmedical effects that can be just as lasting to children. "While we certainly don't like constantly putting children through radiation, if we can't see their medical images, it's often necessary," Srikantan says. "Other times, we have had to call their primary care facility, often at inopportune times, and wait for the images to be delivered via courier. Further, when we can't get the medical files and diagnostic imaging reports we need, or if the patient is really sick, the child may not even be able to fulfill the Wish trip at all." Through this program, Make-A-Wish families—as well as their pediatric care teams—can upload a child's applicable medical images to the cloud before embarking on their trip. That way, if a child should need emergency medical care while traveling, physicians at Arnold Palmer can access the images quickly—leading to more comprehensive care and hopefully less time spent in the hospital for children who seek to live a piece of their dreams. As part of Orlando Health, Arnold Palmer has been utilizing Nuance's PowerShare, a cloud-based medical imaging network, for medical image sharing for six years. "We have more than 2,200 physicians and 50 referring facilities, so it was crucial that our physicians had real-time access to medical images in order to appropriately plan for patient care," says Srikantan, regarding what led the health system to first use this technology. "However, referring providers would often send patients' medical images and records via CDs that were incompatible, unloadable, or forgotten. Both our patients and physicians grew frustrated with delays, repeat imaging scans, and unnecessary radiation exposure." Karen Holzberger, vice president and general manager of diagnostics for Nuance, explains how the technology works. Holzberger says the Nuance PowerShare network comprises health care facilities, providers, and patients who share imaging exams directly with other clinicians and health care organizations via the PowerShare web or mobile application—just as someone would share information with a contact using different consumer tools. "This follows a hub-and-spoke model where a primary organization hosts the network, and facilities near and far can join to share images to make sure the best and fastest care is delivered," she says, noting that it enables smoother care transitions that can expedite important care decisions and reduce redundant exams. Holzberger says PowerShare's ability to enable expedited care can benefit a range of patients. Consider trauma cases, for example. "The first stop for a patient involved in a trauma event might be their local hospital, where initial imaging would probably take place," she says. "Based on initial tests, the hospital may deem it necessary to urgently transfer a patient to a trauma specialty center. Before PowerShare, a patient might be loaded into an ambulance with a CD containing their images taped to their chest. The trauma hospital would be advised of the pending arrival of a trauma patient but, until they have the related images, it is impossible to make plans for the immediate care and treatment of the patient." When the patient arrives, Holzberger says the images on the CD could be unreadable, for various reasons, possibly necessitatating a rescan. "Even if the images are accessible on the CD, it will still require time and resources to upload the images before care planning can take place," she says. "Having images available on the cloud means patient images can be accessed, even while the patient is en route, allowing the care team to create a care plan that can be executed immediately upon the patient's arrival." When Orlando Health first implemented PowerShare, the organization's IT department was not initially supportive "because of our PACS system, physician portal, and lots of questions around security concerns," Gurian says. "However, it didn't take long for IT to see the benefits of PowerShare and the cloud, including the flexibility, decreased cost of storage, and low server space." According to Gurian, radiologists saw the technology's potential from the start. "The radiologists at Arnold Palmer Hospital were enthusiastic about the PowerShare product from its inception," he says. "The ability to review images on a mobile device while on call, away from a desktop computer, allowed us to review images in a timely fashion regardless of the setting." Srikantan says linking the image-sharing technology to Arnold Palmer was not a complicated process. To access the system, Holzberger says clinicians share a PowerShare link with other organizations, who then fill out a profile, download the app, and begin sharing. "There are multiple viewing options, including simple web-based viewers and a mobile application to satisfy a range of needs," she says. Gurian has seen many user benefits from the technology thus far. "As users, we're quickly able to grow our network, since PowerShare has intuitive user interfaces and familiar social networking-live navigation," he says. "It's easy for our team to find other providers and begin sharing medical images within minutes. This means true collaborative care and quicker and better care decisions, especially for high-risk situations where timing is critical." Regarding the user interface, Gurian says he's yet to find a mobile application that's as easy to use as the PowerShare solution. He adds that the ability to scroll through large data sets and adjust the contrast resolution and magnification with simple gestures are useful features. As for workflow, Holzberger says the image-sharing network has the ability to accommodate varying clinician workflows. 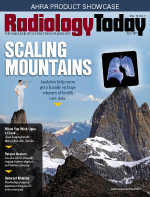 "While radiologists typically view images in the PACS, referring physicians frequently work most effectively in the EHR or EMR," Holzberger says. "The PowerShare network offers integration and image upload, viewing, and sharing, and these can be pulled into PACS and EHR/EMRs easily. This allows the admitting team to see images instantly as well as upload them from outside facilities to incorporate the information into their PACS or vendor-neutral archive, with the added benefit of ensuring patient demographics are properly reconciled." According to Holzberger, Nuance has plans to expand the program to popular Make-A-Wish destinations across the country, to help families traveling outside of Orlando. Srikantan looks forward to the potential benefits that could be brought to more families, as she's seen the program's effects firsthand. "I want to provide a better experience for these Wish families," she says. "And if the inability to get medical information ruins one child's trip, that's one too many. Nuance's Make-A-Wish program is a melding of technology and humanitarian charity that, together, facilitates continuity of care, eases the minds of Wish families, and perpetuates the mission of Make-A-Wish to enrich the human experience with hope, strength, and joy." Gurian agrees: "With cloud-based image sharing, physicians can ease a child's health crisis and ensure a positive outcome of the Wish experience. Even if one child's trip is saved, it's well worth it. While we may not cure these children's diseases, what we're doing is improving their quality of life—especially on what could be the most important trip they'll ever take." — Juliann Schaeffer is a freelance health writer and editor based outside Allentown, Pennsylvania.